Congratulations! The Gutermann team (from left: Dr. Andreas Traub - CTO, Jens Herzberg - Sales Germany, Simon Fechter - Product Manager Fixed Network Monitoring) together with Environment Minister Franz Untersteller. 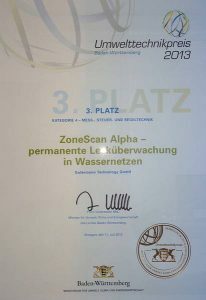 "Efficiency, innovative algorithms, good visualisations and - above all - the possibility of pinpointing and repairing leaks quickly and efficiently“, these were the main factors for the jury to choose Zonescan Alpha at the 3rd Environmental Technology Awards of the German federal state of Baden-Württemberg. 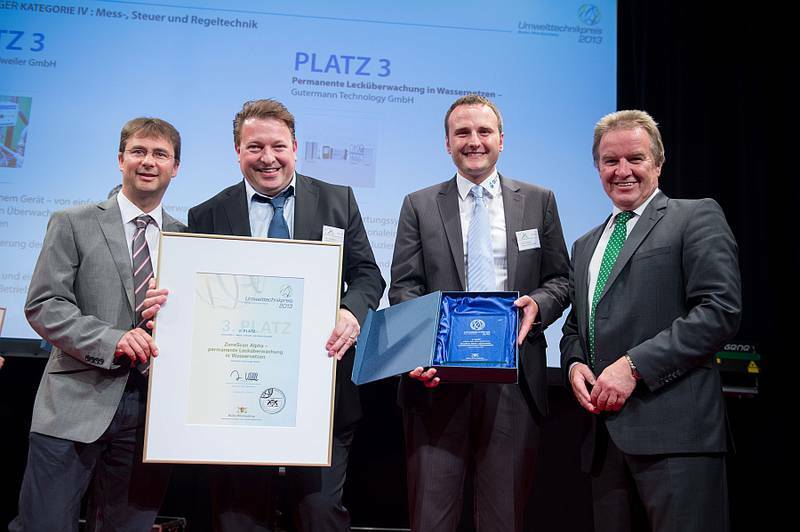 Overall, about 120 companies submitted their technology ideas and products this year at the awards sponsored by the Ministry for Environment, Climate and Energy of Baden-Württemberg. The combined prize money amounts to EUR 100,000. The categories were "Energy Efficiency", "Material Efficiency", "Techniques for Emissions Reduction" and "Process Measuring and Control Technology". This Award is already the sixth technology award that Gutermann has won with ZONESCAN Alpha. The innovative product has lead some competitors to recently launch their own version of permanently installed leakage monitoring systems However, Zonescan Alpha is the only system that provides automatic correlation of all neighbouring logger pairs, enabling utilities to detect leaks even when the leak noise is so low that it remains under the radar of simple noise level alarms. Daily correlation also enables utilities to pinpoint leaks with very high accuracy. This is the main reason, why a number of larger customers have recently decided to purchase and install Zonescan Alpha in their network.